Liberty Mutual Insurance, once the country’s biggest provider of workers’ compensation insurance, is pulling back from the market as its profits get squeezed by increasing medical costs and changing state regulations. The Boston company, which got its start a century ago insuring railway, shipbuilding, and tannery workers hurt on the job, has slipped to No. 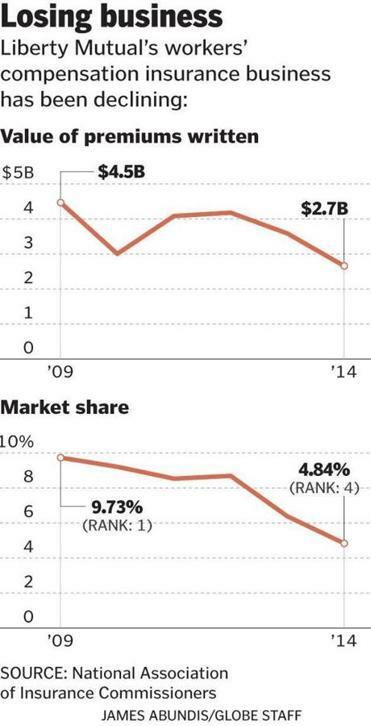 4 by premiums since 2012, according to the National Association of Insurance Commissioners. Its annual workers’ comp premiums dropped by more than a third to $2.7 billion in 2014 from $4.2 billion three years earlier. The insurer — first known as the Massachusetts Employees’ Insurance Association — also has sold off some of its workers’ compensation subsidiaries and paid Warren Buffett’s Berkshire Hathaway Inc. to take over some of its claims. “They’ve taken pretty aggressive action to de-emphasize workers’ comp,” said Michael Lagomarsino, an assistant vice president at A.M. Best Co., a New Jersey-based rating agency that focuses on the insurance industry. Liberty Mutual’s retreat could reduce employers’ options and raise their insurance costs, said Ishita Sengupta, director of workers’ compensation at the National Academy of Social Insurance, a Washington think tank. That may make employers more likely to cut back on injury benefits or challenge claims submitted by workers, she said. “I certainly think it doesn’t bode well,” Sengupta said. Liberty Mutual officials said the company will remain a large player in the market, but is focusing on growing more profitable portions of its business, such as safety consulting and managing the claims and paperwork for companies that insure themselves for workers’ comp. Liberty Mutual also remains committed to the workplace safety studies it conducts at the company’s research institute for safety in Hopkinton, officials said. But the company is “targeting underperforming accounts that were contributing to unacceptable results,” said Paul Condrin, president of Liberty Mutual’s commercial business. For the past 30 years, Liberty Mutual has aspired to be more than just a workers’ compensation insurer, building its auto and home insurance business through several acquisitions. It is now the nation’s second-largest home, auto, and business insurer behind Illinois-based State Farm Insurance. The company also has expanded into Spain, South America, and Russia. Liberty Mutual’s overall profits have grown since it began reducing its cutting its workers’ comp business three years ago. In 2011, the insurer earned $284 million. That rose to $829 million in 2012, $1.7 billion in 2013, and $1.8 billion last year, according to the company’s annual reports. In 2012, Liberty Mutual sold its workers’ compensation business in Argentina. Last year, it shed Summit Holdings Southeast Inc., which was solely a workers’ compensation subsidiary. A few months later, Liberty Mutual announced that it would pay a Berkshire Hathaway company $3 billion to take over some of its workers’ compensation claims, along with liability tied to asbestos and environmental policies. The deal freed Liberty Mutual to spend its money on other projects and investments, instead of having to set aside money for long-term workplace injury claims. Workers’ compensation insurers have turned profits in recent years, boosted by state-approved rate increases, said Mark Dwelle, an analyst with RBC Capital Markets in Virginia. But those rate increases are slowing and running below inflation in many states, Dwelle said. Rising medical costs also are affecting the workers’ compensation market. Medical expenses account for about half of workers’ comp payments and, according to the US Labor Department, medical costs have risen 12 percent since 2011 nationally, more than double the overall rate of inflation during that period. In addition, shifting regulatory environments as businesses lobby state legislatures for reduced costs and labor groups for better benefits have made workers’ comp profits more volatile, Sengupta said. Several states also are considering dropping requirements that companies carry worker’s comp insurance, following the examples of Texas and Oklahoma. Some insurers, however, remain optimistic about workers’ compensation, analysts said. The combination of recent state rate increases and more sophisticated data and technology to control costs, especially medical expenses, provides the potential to boost profits, they said. The Travelers Cos. of St. Paul, Minn., has increased its share of the workers’ comp market and surpassed Liberty Mutual. Companies that were smaller players several years ago, such as Berkshire Hathaway and American Financial Group Inc. of Ohio, also have grabbed more of the market. Liberty Mutual has tended to pay out a larger percentage of its workers’ comp premiums in claims than the industry average, leading to shrinking profits in that business. In 2012, 89 percent of workers’ comp premiums collected by Liberty Mutual were paid out to claims, compared with 68 percent industrywide, according to the National Association of Insurance Commissioners. Liberty Mutual is most interested in providing workers’ comp insurance to companies that buy other business policies from Liberty Mutual, such as commercial automobile coverage, analysts said. The strategy ensures that employers stick with Liberty Mutual for a longer period, since they have several policies with the insurer. Bob Hartwig, president of the Insurance Information Institute, a New York-based industry research group, said Liberty Mutual’s withdrawal from workers’ compensation has not disrupted the market yet. There are still hundreds of companies that offer workers’ compensation insurance at competitive prices, he said. “There are always insurers changing their strategic emphasis,” Hartwig said.